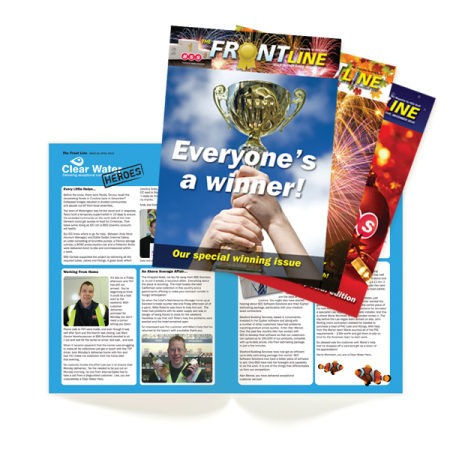 This month we will be designing the 25th edition of BSS Industrial’s staff newsletter – The Front Line. We have been producing the bi-monthly newsletter since the formation of Creative Triangle, in fact it was one of the company’s first jobs! The newsletter has been such a hit with BSS staff across the UK that we have continued to design it for over 4 years now. Regular features include a Rainbow Trust Update – congratulating staff on charity events and money raised by BSS staff, ‘Clear Water Heroes’ – recognising great service given by BSS staff and a section that focuses on individual branches/departments. As well as The Front Line, we also work closely with the Marketing department at BSS Industrial on a variety of other projects including corporate branding and the production of a host of different literature ranging from Introduction guides through to detailed product brochures such as the successful 250 page Drainage guide.